Looking for the best Atv trails around Dubuque? 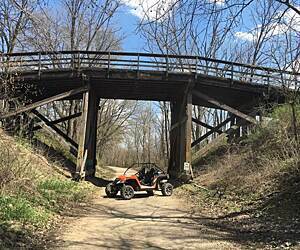 Find the top rated atv trails in Dubuque, whether you're looking for an easy short atv trail or a long atv trail, you'll find what you're looking for. Click on a atv trail below to find trail descriptions, trail maps, photos, and reviews. As others have noted, this trail really needs some upgrading. We road our gravel bikes 50 miles from Gov. Dodge State Park to Mt. Horeb and back and the first thing I would say is NO ROAD OR COMFORT BIKES. Substrate ranges from paved (in the park) to packed gravel to areas (like outside barneveld) where the trail has been reduced to a loose sand Arroyo that is walking only. Some areas that once were paved are weeded over. This is all sad because this trail goes thru some lovely countryside and has some of the nicest scenery of all the rail trails in the state. If you start at gov. Dodge, please be aware that the path to the Military Ridge though paved, is very steep and those not in good physical shape will have to walk a ways or join the trail somewhere else. Folks with hybrids should be able to manage the shifting terrain but be careful of soft spots and deep gravel. It is well worth the ride but this is a sadly neglected resource . 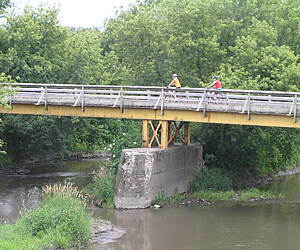 Easy ride from Monroe to Mineral Point. Weekends on trail are too busy. Plenty of places to get gas and/or supplies approx every 5-7 miles. DNR and Sheriff always on trail. Trail can have some serious jagged rocks so bring repair kit or spare. Watch out for erosion some serious wash outs in places. Most of the small towns are very welcoming to atv/utv except Mineral Point (most Mineral Point businesses only take cash) experienced rude and unwelcoming town folk / businesses and an atv route that does not let you drive or park in the business area. You have to park on the atv route which runs on the outskirts of town then just stops at a gas station..you park blocks away and walk in. Most businesses closed during the week in Mineral Point..think they would want, need and welcome the revenue...guess they don't. Bring cash if you decide to visit. Check out Leftys and Ponchos in Monroe great food and people! trails were not bad. it is limestone or gravel. Encountered atvs and they gave plenty of space or stopped and waved. Well maintained and paved trail!! It has a stream running alongside, well lit with LED lights, dog park, workout center. By November 2017, this trail will be paved all the way to Belmont!!! Can’t wait!